The 1972 Atlantic hurricane season was a significantly below average season, having only four fully tropical named storms – the fewest since 1930. It officially began on June 1, 1972, and lasted until November 30, 1972. These dates conventionally delimit the period of each year when most tropical cyclones form in the Atlantic basin. The first storm, Subtropical Storm Alpha, developed on May 23 off the Southeast United States and struck Florida, causing minor damage and two fatalities. Although several other tropical depressions developed, only Tropical Depression Five is known to have affected land. The most significant storm of the season was Hurricane Agnes, which at the time was the costliest United States hurricane, until Frederic in 1979. After brushing the western tip of Cuba, the hurricane made landfall on the Florida Panhandle. It caused at least $2.1 billion (1972 USD)[nb 1] in damage and 137 fatalities, mostly from inland flooding in Pennsylvania and New York. The strongest hurricane of the season was Betty, which reached peak winds of 105 mph (165 km/h) while west of the Azores. Tropical Storm Carrie passed just offshore of Massachusetts, causing heavy rainfall and resulting in four fatalities, but leaving only $1.78 million in damage. The remaining tropical systems – Dawn, Charlie, and Delta – caused no significant effects on land. A strong El Niño kept hurricane activity at a minimum, with only four tropical storms, three subtropical storms, and three hurricanes. It was also one of only five hurricane seasons since 1944 to have no major hurricanes – the other years being 1968, the 1986, 1994, and 2013. In addition, the season was the first to name subtropical storms, using the Phonetic Alphabet, rather than the standard naming list. Collectively, the storms of the 1972 Atlantic hurricane season resulted in 137 deaths and over $2.1 billion in damage. The Atlantic hurricane season officially began on June 1, 1972. Although 19 tropical cyclones developed, only seven of were named, below the 1950-2000 average of 9.6 named storms per season. Of the seven tropical or subtropical storms, three of them strengthened into a hurricane, which is also below average. None of the three hurricane became major hurricanes, which is Category 3 or greater on the Saffir–Simpson hurricane wind scale. Overall, the season was inactive, despite having a similar number of tropical waves as the previous season. The lack of activity was attributed to an El Niño – which causes below normal sea surface temperatures over the eastern Atlantic – and strong vertical wind shear. One subtropical storm and two hurricanes made landfall during the season and caused at least 137 fatalities and more than $2.1 billion in damage. The last storm of the season, Subtropical Storm Delta, became extratropical on November 7, about 23 days before the official end of hurricane season on November 30. Tropical cyclogenesis first occurred in the month of May, with the development of Subtropical Storm Alpha. The month of June featured three tropical cyclones, including Hurricane Agnes and two tropical depressions. Three more systems formed in July, though all of them failed to reach tropical storm status. August was the most active month of the season, with five systems, including Hurricane Betty, Tropical Storm Carrie, and three tropical depressions. September featured slightly less cyclogenesis, with Hurricane Dawn, Subtropical Storm Charlie, and two tropical depressions. An additional three tropical depressions formed in October. Subtropical Storm Delta was the sole system in November, lasting from November 1 to November 7. The season's activity was reflected with an Accumulated Cyclone Energy (ACE) rating of 36, the lowest value since 1962. Broadly speaking, ACE is a measure of the power of a tropical or subtropical storm multiplied by the length of time it existed. Therefore, a storm with a longer duration, such as Betty, will have high values of ACE. It is only calculated for full advisories on specific tropical and subtropical systems reaching or exceeding wind speeds of 39 mph (63 km/h). Accordingly, tropical depressions are not included here. After the storm has dissipated, typically after the end of the season, the NHC reexamines the data, and produces a final report on each storm. These revisions can lead to a revised ACE total either upward or downward compared to the operational value. A subtropical depression developed from a cold-core low pressure area southeast of the Carolinas on May 23. After initially moving northeastward, it turned sharply southward on May 26 due to a building ridge of high pressure. 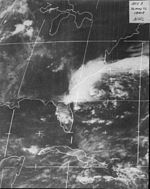 Later that day, the system strengthened into Subtropical Storm Alpha and proceeded to move toward the coast of Georgia. After peaking with maximum sustained winds of 70 mph (110 km/h), Alpha began weakening. 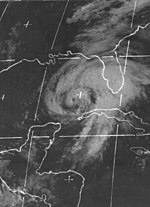 Late on May 27, the storm made landfall near Brunswick, Georgia, with winds of 45 mph (75 km/h). Alpha weakened to a subtropical depression and dissipated after entering the northeastern Gulf of Mexico on May 29. Rough seas generated by the storm resulted in two people drowning in Florida and halted work to deepen a harbor at the Mayport Naval Station in Jacksonville. Tides along the Georgia coast reached 2 to 3 ft (0.61 to 0.91 m) above normal, which caused some flooding and beach erosion. Wind gusts reached 58 mph (93 km/h) on Saint Simons Island. The winds knocked down trees and power lines, leaving some people without power in eastern Georgia. Damage was minor but widespread in the state, estimated at over $50,000. Moderate rains spread in coastal areas from South Carolina through southern Florida. Alpha was the first named subtropical storm. A polar front and an upper trough over the Yucatán Peninsula spawned a tropical depression on June 14. The storm emerged into the western Caribbean Sea on June 15, and by the following day, it strengthened into Tropical Storm Agnes. The storm curved northward and brushed western Cuba on June 17. Agnes continued to intensify, and on June 18, it was upgraded to a hurricane. Minimal fluctuations in intensity occurred before the storm made landfall near Panama City, Florida, on June 19. After moving inland, Agnes rapidly weakened and was only a tropical depression when it entered Georgia. Thereafter, weakening slowed as the storm crossed over Georgia and into South Carolina. However, while over eastern North Carolina on June 21, Agnes re-strengthened into a tropical storm, as a result of baroclinic activity. Early the following day, the storm emerged into the Atlantic Ocean before re-curving northwestward and making landfall near New York City as a strong tropical storm. Agnes quickly merged with a non-tropical low pressure system on June 23. Heavy rainfall occurred in western Cuba, causing flooding that destroyed 97 houses, isolated a few cities, and flatted crops in low-lying areas. The storm left seven fatalities. 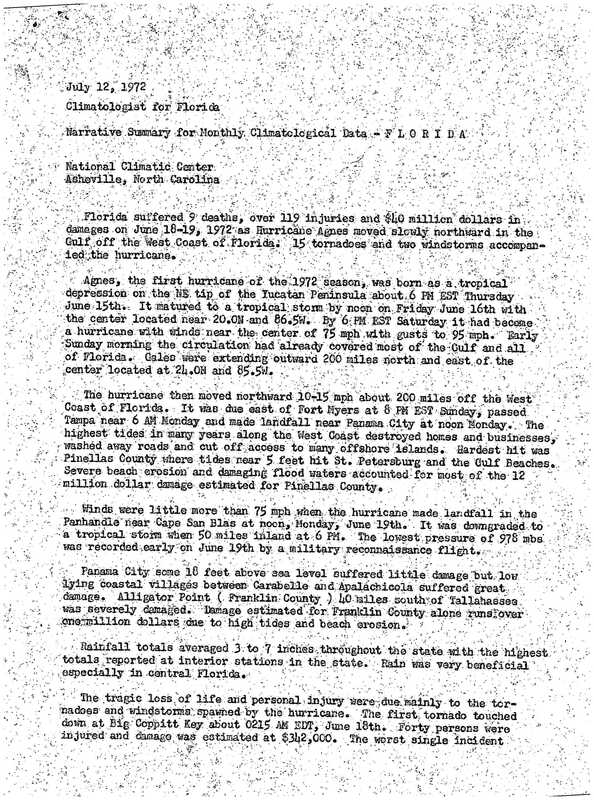 Agnes caused a significant tornado outbreak, with at least 26 confirmed twisters, 24 of them in Florida and the other two in Georgia. The tornadoes alone resulted in over $4.5 million in damage and six fatalities. At least 2,082 structures in Florida suffered either major damage or were destroyed. About 1,355 other dwellings experienced minor losses. Though Agnes made landfall as a hurricane, no hurricane-force winds were reported. Abnormally high tides resulted in extensive damage, especially between Apalachicola and Cedar Key. The storm left nine deaths and approximately $40 million in damage in Florida. Generally minor effects were also recorded in the states of Alabama, Delaware, Georgia, Ohio, South Carolina, and Tennessee, as well as the New England region. However, one fatality was reported in Delaware and three were recorded in Georgia. The most significant effects, by far, occurred in Pennsylvania, mostly due to severe flooding. Precipitation peaked at 18 in (460 mm) in Schuylkill County, causing several creeks and rivers crest at record height, including the Delaware, Juniata, Lackawanna, Susquehanna, and West Branch Susquehanna rivers. More than 100,000 people were forced to leave their homes due to flooding. In the state of Pennsylvania, more than 3,000 businesses and 68,000 homes were destroyed, leaving at least 220,000 people homeless.Overall, Agnes is ranked as the worst natural disaster in Pennsylvania. New York also suffered severe damage. Similarly, rivers in the state crested high, including the Allegheny, Chemung, Genesee, Susquehanna, and Tioga rivers. Corning, Elmira, and Olean, as well as many other Southern Tier towns, were severely flooded. Throughout New York, 32,832 homes were damaged and 628 others were damaged. A total of 1,547 small businesses were extensively damaged or demolished. In Canada, a mobile home was toppled, killing two people. Overall, Agnes caused 131 fatalities and over $2.1 billion in damage. An area of disturbed weather appeared on satellite imagery while forming within an old frontal zone on August 21. At 1200 UTC on the following day, a subtropical depression developed about 290 mi (470 km) north-northeast of Bermuda. The system strengthened slowly as it headed east-northeastward or eastward and by August 24, it became Subtropical Storm Bravo. During the next 24 hours, minimal intensification occurred. However, a deepening high-level trough and a building ridge enhanced outflow and deep convection on August 25. Additionally, reconnaissance aircraft flights began indicating a transition to a warm-core. Unfavorable northwesterly winds briefly halted further development, though by late on August 26, Bravo resumed acquiring tropical characteristics after another deepening trough accelerated the storm eastward. After reconnaissance aircraft reported winds of 98 mph (158 km/h) and satellite imagery indicated a storm with a classic cyclonic appearance, Bravo was reclassified as Hurricane Betty while located about 920 mi (1,480 km) west of the Azores on August 27. After some further strengthening, Betty attained its peak intensity as a Category 2 hurricane with maximum sustained winds of 105 mph (165 km/h) and a minimum barometric pressure of 976 mbar (28.8 inHg) early on August 28. The hurricane then moved rapidly east-northeastward before decelerating late on the following day. Around that time, northerly winds aloft caused Betty to weaken to a Category 1 hurricane. After briefly moving southward, the storm curved back to a general westward direction and fell to tropical storm intensity on August 31. Later that day, Betty turned northward ahead of a trough and became extratropical about 565 mi (910 km) northwest of Corvo Island in the Azores on September 1. A complex system combining a tropical wave and an upper level low led to the formation of a tropical depression east of Florida on August 29. It managed to become a tropical storm on August 31 and reached initial peak winds of 60 mph (95 km/h) later that day. However, upper-level winds increased, causing Carrie to weaken to a minimal tropical storm by September 2. Due to baroclinic processes, Carrie began to re-intensify. As a result, Carrie attained its peak winds of 70 mph (110 km/h) just prior to transitioning into an extratropical cyclone on September 3. The extratropical cyclone continued northeastward, and struck eastern Maine on September 4. By the following day, the extratropical cyclone dissipated over the Gulf of Saint Lawrence. Carrie had a minimal impact on the East Coast south of New England, limited to increased swells, gusty winds, and light rainfall. The worst conditions occurred over southeastern New England, where wind gusts reached 84 mph (135 km/h) and rainfall exceeded 1 ft (0.30 m). Damage was most severe along and slightly inland from the coast. Thousands of people became stranded on offshore islands of Massachusetts after dangerous conditions created by the storm prompted the suspension of steamship service. Overall, damage was generally light, with total monetary losses valued at $1.78 million. Four deaths were blamed on the storm. A tropical wave, combined with an upper trophospheric trough, resulted in the development of a tropical depression near Cay Sal Bank, Bahamas, on September 5. Later that day, the depression struck Key Largo, Florida, before moving inland over the mainland of Florida. The storm brought very light rainfall to the state, peaking at 1.19 in (30 mm) in Tavernier. The system moved northeastward and soon re-emerged into the Atlantic. While located north of Grand Bahama on September 6, the depression intensified into Tropical Storm Dawn. On September 7, a cold low pressure developed near Cape Hatteras, North Carolina, which would influence much of Dawn's movement. Around that time, the storm strengthened into a Category 1 hurricane. Dawn then curved west-northwestward on September 8 and peaked with maximum sustained winds of 80 mph (130 km/h) and a minimum barometric pressure of 997 mbar (29.4 inHg). With Dawn appearing as a threat to the Mid-Atlantic, storm and gale warnings were issued from Chincoteague Inlet, Virginia, to Cape May, New Jersey, on September 8. However, the hurricane veered southeastward on September 9 and weakened to a tropical storm. By late on September 10, after the cold low pressure area relinquished influence over Dawn, the cyclone began moving westward, but continued to deteriorate. Dawn weakened to a tropical depression while well east of Georgia late on September 12. The system approached the Sea Islands on September 13, but curved northeastward and remained offshore. Dawn dissipated less than 15 mi (25 km) east of Isle of Palms, South Carolina, on September 14. The storm also produced very light rainfall in Georgia and South Carolina. A very small, circular subtropical depression developed about 460 mi (740 km) northeast of Bermuda on September 19. Initially, the storm moved north-northeastward and strengthened into Subtropical Storm Charlie early the following day. It then moved quickly northeastward and continued to strengthen. 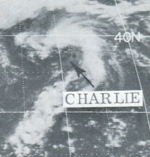 Later on September 20, Charlie peaked with maximum sustained winds of 65 mph (100 km/h). The system soon lost tropical characteristics and transitioned into an extratropical cyclone about 630 mi (1,010 km) east of Cape Race, Newfoundland, early on September 21. However, the extratropical storm deepened significantly, reaching a barometric pressure of 944 mbar (27.9 inHg), a reading typical of a strong Category 3 hurricane. Early on September 22, the extratropical cyclone dissipated over the far north Atlantic. A southwestward-moving cold-core low pressure area developed into a subtropical depression while located about 950 mi (1,530 km) west-southwest of Flores Island in the Azores on November 1. After forming, the system soon strengthened and was upgraded to Subtropical Storm Delta. Early on November 3, Delta attained its peak intensity with maximum sustained winds of 45 mph (75 km/h) and a minimum barometric pressure of 1,001 mbar (29.6 inHg). Around that time, the subtropical storm briefly moved southward, before beginning a general eastward movement on November 4. Delta soon began to weaken and was reduced to a subtropical depression by the following day. It continued eastward until November 6, at which time the storm decelerated and curved northward. Delta dissipated while located about 790 mi (1,270 km) southwest of Flores Island. In addition to the named storms, there were several weak depressions during the season. As Agnes was moving over the southeastern United States, a tropical depression formed approximately 400 mi (640 km) southwest of Bermuda on June 19. It moved northeastward and headed toward the island. The depression dissipated later the following day. The next system, numbered Tropical Depression Five, developed offshore North Florida on July 10. Moving generally northward, Tropical Depression Five made landfall near Cape Fear in North Carolina on July 12. The depression dissipated over Virginia about two days later. Generally light rainfall was reported in several states, though 8 in (200 mm) of precipitation was recorded on Cedar Island, North Carolina. Another tropical depression originated about 430 mi (690 km) southwest of Flores Island in the Azores on July 16. It trekked slowly until July 19, at which time the system curved northeastward. Late the following day, the depression dissipated about 225 mi (360 km) west of Flores Island. On July 31, a tropical depression formed about 515 mi (830 km) southeast of Bermuda. The depression moved southwestward, toward the Bahamas and Lesser Antilles, but dissipated about 225 mi (360 km) northeast of Turks and Caicos Islands on August 3. A tropical depression developed over Senegal on August 5. Tracking westward, the depression passed south of Cape Verde before dissipating southwest of the islands on August 8. Four days later, another tropical depression originated about 175 mi (280 km) east-southeast of Charleston, South Carolina. It moved slowly northeastward and intensified slightly, but dissipated about 210 mi (340 km) southeast of Cape Hatteras, North Carolina, on August 15. The tenth tropical depression formed on August 16 while offshore Senegal. Moving generally westward, the cyclone crossed through Cape Verde and struck the islands of Fogo and Santiago. By August 18, the depression dissipated. Another tropical depression developed about 800 mi (1,300 km) east-southeast of Bermuda on September 3. The system moved northeastward toward the Azores, but degenerated about 750 mi (1,210 km) southwest of Flores Island on September 5. The next tropical depression formed on September 20 while located about 570 mi (920 km) west-southwest of Cape Verde. The storm tracked generally westward, but then began moving west-northwestward on September 21. Three days later, the depression dissipated about 890 mi (1,430 km) east-northeast of Barbados. On October 1, a tropical depression originated about 700 mi (1,100 km) east-southeast of Bermuda. The depression trekked generally northward and dissipated about 505 mi (815 km) south-southeast of Cape Race, Newfoundland, on October 3. Yet another tropical depression formed about 120 mi (190 km) west of Bolama, Guinea-Bissau, on October 5. The depression moved generally westward, before curving to the northwest on October 8. Five days later, it turned northward while well northeast of the Lesser Antilles. By October 14, the system began moving north-northeast. The depression dissipated about 800 mi (1,300 km) east-northeast of Bermuda on the following day. Yet another tropical depression formed about 445 mi (715 km) southwest of Brava, Cape Verde, on October 16. Initially the depression moved generally west-northwestward and dissipated about halfway between Barbados and Cape Verde. The following names were used for named storms that formed in the North Atlantic in 1972. Names that were not assigned are marked in gray. Storms were named Agnes, Betty and Dawn for the first time in 1972. The name Agnes was later retired. The following names were used for subtropical storms (sometimes called neutercanes) in the Atlantic basin for this year. This year was the first year to use the Phonetic Alphabet for these storms. Names that were not assigned are marked in gray. This is a table of the storms in 1972 and their landfall(s), if any. Deaths in parentheses are additional and indirect (an example of an indirect death would be a traffic accident), but are still storm-related. Damage and deaths include totals while the storm was extratropical or a wave or low. ^ a b c d e f g h i j k l m n o p q r s R. H. Simpson; Paul J. Herbert (April 1973). "Atlantic Hurricane Season of 1972" (PDF). National Hurricane Center. Archived (PDF) from the original on 25 May 2011. Retrieved May 7, 2011. ^ a b c Final environmental statement: proposed 1972 outer continental shelf oil and gas general lease sale offshore eastern Louisiana. United States Bureau of Land Management. Washington, D.C.: United States Department of the Interior. 1972. p. 28. Retrieved July 8, 2015. ^ a b c Eric S. Blake; Christopher W. Landsea; Ethan J. Gibney (August 2011). The Deadliest, Costliest, And Most Intense United States Tropical Cyclones From 1851 To 2010 (And Other Frequently Requested Hurricane Facts) (PDF). National Hurricane Center (Report). Miami, Florida: National Oceanic and Atmospheric Administration. Archived (PDF) from the original on November 27, 2012. Retrieved July 10, 2014. ^ a b c d e f g h i j k l m n o p q r "Atlantic hurricane best track (HURDAT version 2)". Hurricane Research Division (Database). National Hurricane Center. May 1, 2018. Retrieved April 23, 2019. ^ a b c Philip J. Klotzbach; William M. Gray (April 10, 2014). Extended Range Forecast of Atlantic Seasonal Hurricane Activity and U.S. Landfall Strike Probability for 2014 (PDF) (Report). Fort Collins, Colorado: Colorado State University. p. 2. Archived (PDF) from the original on August 22, 2014. Retrieved July 8, 2015. ^ a b "Naval and Coastal Damage" (PDF). Retrieved 23 July 2018. ^ a b c "Storm Data May 1972" (PDF). National Climatic Data Center. National Oceanic and Atmospheric Administration. 14 (5). Archived from the original (PDF) on July 7, 2015. Retrieved July 7, 2015. 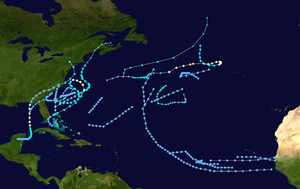 ^ a b c Hurricane History. National Hurricane Center (Report). Miami, Florida: National Oceanic and Atmospheric Administration. 2008. Archived from the original on October 21, 2011. Retrieved July 8, 2015. ^ a b c (in French) Page d'histoire - Juin (Report). La Météo au Quotidien. Archived from the original on March 7, 2016. Retrieved July 8, 2015. ^ a b Atlantic basin Comparison of Original and Revised HURDAT. Hurricane Research Division; Atlantic Oceanographic and Meteorological Laboratory (Report). Miami, Florida: National Oceanic and Atmospheric Administration. February 2014. Archived from the original on March 29, 2014. Retrieved July 8, 2015. ^ "Cyclone Serves Notice of Hurricane Season". The Tuscaloosa News. Miami, Florida. Associated Press. May 28, 1972. Retrieved July 7, 2015. ^ Severe Weather Statement. National Weather Service Office Savannah, Georgia (Report). Savannah, Georgia: National Hurricane Center; National Oceanic and Atmospheric Administration. May 28, 1972. Archived from the original on July 8, 2015. Retrieved July 7, 2015. ^ Paul J. Hebert (May 28, 1972). Bulletin Eight. National Hurricane Center (Report). National Oceanic and Atmospheric Administration. Archived from the original on July 8, 2015. Retrieved July 7, 2015. ^ David M. Roth (October 26, 2007). Subtropical Storm Alpha – May 23-29, 1972. Weather Prediction Center (Report). College Park, Maryland: National Oceanic and Atmospheric Administration. Archived from the original on March 4, 2016. Retrieved July 19, 2015. ^ Staff Writer (June 18, 1972). "Agnes Ranked As Hurricane". Reading Eagle. Miami, Florida. Associated Press. Retrieved January 9, 2012. ^ a b c "Storm Data June 1972" (PDF). National Climatic Data Center. Asheville, North Carolina: National Oceanic and Atmospheric Administration. 14 (6). Archived from the original (PDF) on July 8, 2015. Retrieved July 8, 2015. 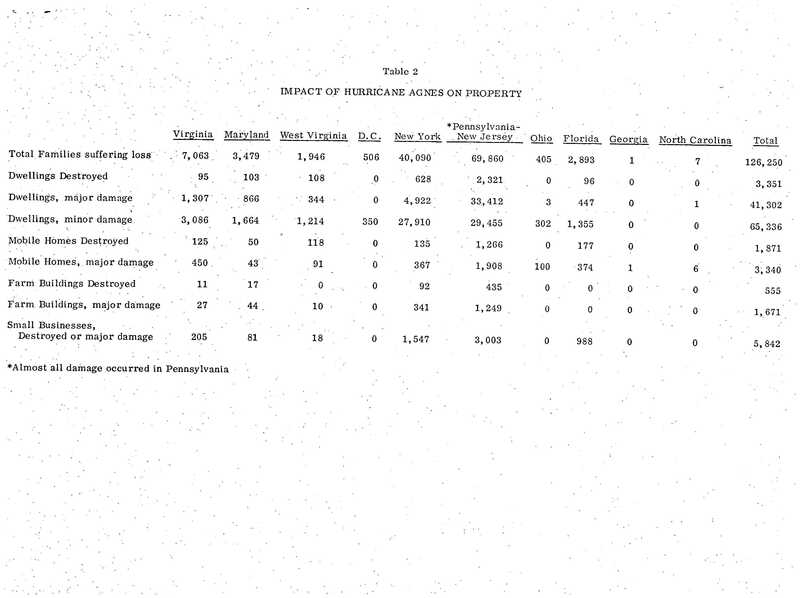 ^ a b Impact Of Hurricane Agnes On Property. National Hurricane Center (Report). Miami, Florida: National Oceanic and Atmospheric Administration. 1972. Archived from the original on March 4, 2016. Retrieved January 8, 2012. ^ Narrative Summary for Monthly Climatological Data - Florida. National Climatic Data Center (Report). Asheville, North Carolina: National Oceanic and Atmospheric Administration. July 12, 1972. Archived from the original on March 4, 2016. Retrieved September 5, 2015. ^ David M. Roth (September 30, 2006). Hurricane Agnes - June 14–25, 1972. Weather Prediction Center (Report). Camp Springs, Maryland: National Oceanic and Atmospheric Administration. Archived from the original on March 3, 2016. Retrieved September 5, 2015. ^ a b J. F. Bailey; J. L. Patterson (1975). Hurricane Agnes Rainfall and Floods, June-July 1972 (PDF). United States Geological Survey (Report). Reston, Virginia: National Oceanic and Atmospheric Administration. Archived (PDF) from the original on March 5, 2016. Retrieved September 5, 2015. ^ "Flood Situation State by State". Miami Herald. Miami, Florida. United Press International. June 24, 1972. Archived from the original on January 2, 2014. Retrieved September 5, 2015. ^ "River begins to recede in Pennsylvania, but flooding persists". CNN. Retrieved 23 July 2018. ^ "Hurricane Agnes still ranks as Pa.'s worst disaster". USA Today. Harrisburg, Pennsylvania. Associated Press. June 20, 2002. Archived from the original on September 24, 2015. Retrieved September 11, 2015. ^ a b David M. Roth (November 13, 2007). Tropical Storm Dawn – September 4-15, 1972. Weather Prediction Center (Report). College Park, Maryland: National Oceanic and Atmospheric Administration. Archived from the original on March 4, 2016. Retrieved July 14, 2015. ^ David M. Roth (March 6, 2013). Tropical Depression Five - July 10-14, 1972. Weather Prediction Center (Report). College Park, Maryland: National Oceanic and Atmospheric Administration. Archived from the original on March 4, 2016. Retrieved June 21, 2015. ^ "Betty, Carrie, etc. List Continues". Palm Beach Daily News. July 16, 1972. p. 11. Retrieved July 8, 2015. ^ Tropical Cyclone Naming History and Retired Names. National Hurricane Center (Report). National Oceanic and Atmospheric Administration. April 17, 2015. Archived from the original on June 28, 2011. Retrieved July 7, 2015.